A perfect setting for your perfect day. Your venue sets the scene for the look and feel you want to convey on your special day. With a stunning backdrop like Arrowhead Golf Club, your wedding day will be one to remember. Arrowhead Golf Club’s spacious wedding facilities offer a picturesque atmosphere for one of the most important days of your life. Situated on our championship golf course between hole five and six, the grounds are surrounded by manicured grass, rolling hills and old growth forest, adding a remarkable Pacific Northwest beauty to your wedding. Arrowhead provides many of the essentials for your ceremony and reception, seating and tabling, as well as full event set up and tear down. Features include stages for live music and/or a DJ, adjustable dance floor, rustic outdoor lighting and customizable seating. Full-service catering is available. Planning your wedding has never been easier. Arrowhead’s dedicated Event Coordinator is available to help synchronize the many moving parts needed to realize your vision. While we handle the logistics, we encourage you to bring your own creative vision: decorations, centerpieces, music, arrangements and more, add your unique personality and taste, making your wedding the one you always dreamed of. Our outdoor wedding venue can accommodate up to 300 people, while easily scaling down for a smaller, more intimate celebration. Choose the setting for your ceremony and your reception.Exclusive use of the Arrowhead Wedding Venue up to 10 hours. Additional hours are an option with prior planning. Your personal venue coordinator to ensure proper planning, management, and set up throughout your entire planning experience, and celebration at Arrowhead Golf Club. 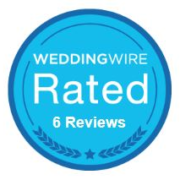 Experienced crew for full set up and breakdown of the ceremony and reception. Parking attendants upon guest arrival. A table for the display of the cake, gifts, guest book, ceremony traditions, bridal party, buffet line and for the DJ to set up his equipment. A 13’ X 13’ Oak Dance floor. Choice from assorted napkin colors. Cake cutting by Legend’s staff. Portable bar and bartender for the duration of your wedding. One hour for the rehearsal and banquet room inside Legend’s Bar & Grill to accommodate friends and family for the rehearsal dinner. Private rooms for the bridal party to get ready in. Two golf carts for the bride and groom to venture out on to the course with their photographer for photos.